Robbie is an Occupational Therapist, Epona Approved Instructor, and an Energy Kinesiology Practitioner. Robbie has a deep connection with the earth that fuels her passion for plant medicine. She has studied homeopathy and herbs as well as Chinese and Tibetan energy medicine. Robbie is eclectic in her spirituality. She integrates ceremony, Celtic shamanism and plant medicine in her lifework. She honors “The Way of The Horse” as a grounded and heart centered path towards the evolution of human consciousness. 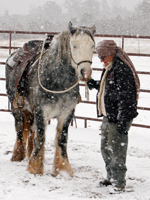 It is her life’s joy to share the path of horse medicine at the Buffalo Woman Ranch. For those of you who do not follow us on our Facebook page, it will probably come as a surprise to learn that I suffered a stroke on 9/20/2014. I was in the hospital for 8 weeks and am now back home on the ranch. Thanks to my beloved partner Cody and her quick action to get me care, the neurosurgeon at St. Mary’s in Grand Junction, and the out- pouring of love and prayer, I have had a ”robust recovery” as my doctor termed it. I have left-sided weakness in my leg and arm and some remaining sensory deficits on the left. I can do most self – care without assistance and I am walking with a walking stick. I feel very blessed. We’ve had the opportunity to release old patterns and embrace the grace of life, our beloved friends and family. Do to the major life changes this experience has created I am no longer able to work at my previous capacity on the reservation. Creating income to support the ranch is different now. I am happy to say that we do plan to continue evolving the horse work here on the ranch, after time off this winter for continued healing. Cody is selling her art too which is a tremendous asset to the ranch, as well as those who have it in their presence! Please check out BWR Facebook for our upcoming ‘sponsor a horse’ program, etc. Charlie walked a path as Medicine Woman and Pipe Carrier for over 20 years. She studied with Native American, Celtic and Eastern medicine teachers. Her gift was facilitating empowering experiences to enhance physical, emotional and spiritual growth in walking one’s life journey. Her lifework was leadership, women’s self-healing, self-empowerment, way of council, transformative journeys/adventures, story telling and ceremony. Integrating horses as co-facilitators into her life’s work at the Buffalo Woman Ranch was one of her greatest blessings. Charlie was initiated into “Horse Medicine” by Rasa’s foal ‘Spirit of Epona’ and ‘Shoshoni’, a wild mustang. She believed deeply in this path of love and service. 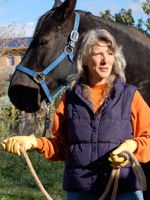 In addition to her accomplishments at the Buffalo Woman Ranch, Charlie was the Founder of American Holistic Nurses Association, an Epona Advanced Instructor, a councilor, a Certified Holistic Nurse Practitioner and Co-Founder of the Southwest Institute for Women. Charlie transitioned from breast cancer in May of 2008. Cody is a talented singer songwriter, artist, and a certified Ski Instructor for children ages 3-12 years of age. 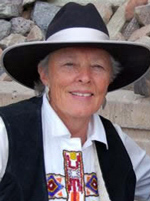 She is a 7th generation Coloradoan and has many gifts of spirit from her deep connection with the earth, animals and people. Cody has over 20 years of experience instructing children in outdoor programs. Cody has brought great beauty and love to Buffalowoman Ranch, decorating and fencing the horse paddocks, decorating the ranch house and outbuildings, co-creating greenhouses and much more during her 4 years here. 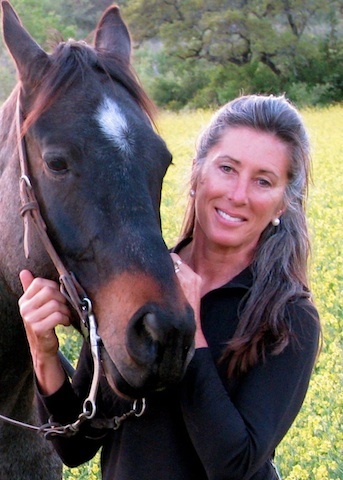 She has co-facilitated many EFL sessions with Robbie and particularly loves to take clients on crystal hunting and mushroom hunting adventures in the beautiful San Juan Mountains of CO.
Marisa has over 20 years equestrian experience. 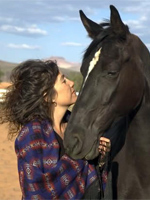 Starting with a background in biochemistry and dolphin field research, she has taken her profound psychic talents to work in cutting edge equine experiential programs, spent time with wild mustangs in herd settings, and provides equine communication for some top racing and training stables. Marisa has assisted in Development of our EFIH Certification program and is a Co-Facilitator for Module III and Advanced training. Lissa has been a lifelong student of the horse. She received her ranch management degree, started training young horses, has shown in cutting, cowhorse and competitive trail competition, holds a judge’s card for competitive trail and has taught riding for 30 years. Whether teaching friends the basics while trail riding or instructing clients how to reach a goal of showing their own horse in competition, she is all about sharing the healing power and clarity of mind spent in the company of horses. Her experience training police horses and for the last 20 years, guiding interpretive nature trail rides in the Texas Hill Country has proven to her time and again that there is more going on when a human and horse make contact, than just a petting or riding opportunity. She became a trained life coach in 2009 and coached clients while they rode and walked with horses. To deepen her understanding of the healing power of horses, she became certified in the Epona method of EFL here at Buffalo Woman Ranch. Lissa teaches our new non-riding “Horsemanship 101” classes and will also work with you and your own horse on our “walk through” obstacle course. Lissa will be living at BWR from May 1st through 9/30/2015. If you are interested in private lessons with Lissa, with your horse or one from BWR call (970) 677-2939 to schedule a session.